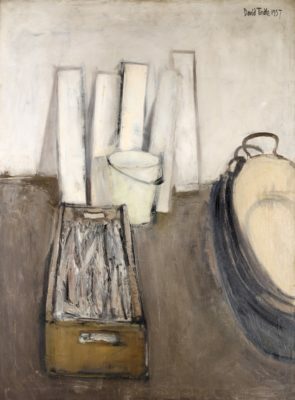 Tindle was elected a Royal Academician in 1979 and Senior RA in 2007. Retrospectives of his work were held at Coventry Art Gallery in 1957, The Northampton Art Gallery in 1972 and at The Redfern Gallery and The Huddersfield Art Gallery in 2016/17. The artist has been included in a number of important group exhibitions such as The International Biennale of Realistic Art, Bruges 1958, British Painting at The Hayward Gallery in 1974 and 25 Years of British Painting at the RA in 1977.